For consumers of anabolic steroids, the positive effect of Altamofen 20 mg can manifest itself both during and after taking anabolic steroids, but taking after the course is the main one. Anabolic steroids, such as Testosterone and Nandrolone, among others, will increase the serum levels of estrogen. This is due to the conversion of the hormone testosterone to testosterone, which occurs due to the metabolism of the enzyme aromatase. After aromatization, the amount of estrogen increases, which can lead to gynecomastia and water retention. If water retention becomes severe, it can cause high blood pressure. Tamoxifen Citrate does not lower serum estrogen levels, but by binding to its receptors in the chest, it prevents binding to estrogen. If you have problems with water retention, the drug will not be too effective. It will also not be enough to protect against gynecomastia for most men, but it depends on how high estrogen levels are, as well as on genetic propensity. For greater and stronger protection, it is recommended to take Aromatase Inhibitors (AI). IAs are antiestrogens that inhibit aromatase action and lower serum estrogen levels. 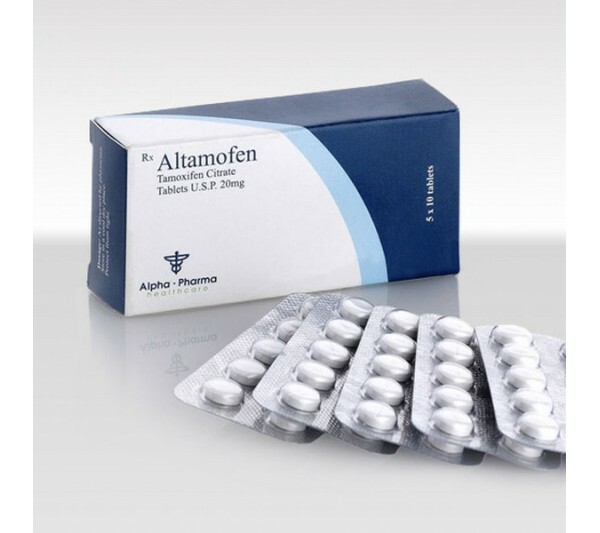 Now about testosterone-stimulating action of Altamofen 20. Of course, this is the most important action for anabolic steroid users. Taking anabolic steroids, natural testosterone production will be suppressed, it will occur regardless of the steroids taken. Acceptance of steroids creates negative feedback and signals the pituitary gland to stop the production of LH and FSH. For this reason, virtually every course of steroids includes exogenous testosterone, so that negative feedback does not cause low testosterone levels. As soon as steroids are taken, you need a boost to start testosterone production. This process will occur by itself, but very slowly, and Tamoxifen can accelerate it and make it more efficient. After taking Tamoxifen, LH and FSH levels will start to increase, and as a result, testosterone will be produced. Important note: PCT involves taking Tamoxifen Citrate or any other SERM to make the process more effective, it is assumed that there is no low testosterone state. It is also assumed that during the administration of steroids, the axis of the hypothalamus-pituitary-testicles was not harmed. If there are low levels, Tamoxifen Citrate will not fix them in a magical way. If the HHH axis was damaged, then recovery would be impossible and, most likely, low testosterone therapy would be required. Important note: Many steroid users believe that a good PCT will lead to full recovery, but this is a false belief. PCT, including Tamoxifen Citrate, will stimulate recovery, but will not complete it. Full recovery in any case will take several months, with PKT there are much more chances for this than without it. For patients with breast cancer, Altamofen 20 is probably even simpler than for anabolic steroids users. Estrogen attaches and “nourishes” the cancer, but Tamoxifen Citrate prevents this attachment and causes the cancer to “starve”. This is a simple but effective treatment. But this drug is not the only one used in the treatment; Often, treatment begins with an AI, then it is replaced with a SERM, such as Tamoxifen Citrate. It is also used as a preventive measure by those who have had breast cancer cases in the family.